Standing on a very damp road in the pouring rain and gale-force winds, screaming at the dog, who was merrily bounding after a sheep who came from nowhere, was not how I envisioned my relaxing Scottish Highlands holiday to be. Luckily for all concerned, the sheep fell over. Rory, who has absolutely no killer instinct, stopped dead and looked back at me as if to say, “Why did it stop running? This is completely your fault.” And not giving the terrified and luckily unharmed sheep so much as a backwards glance trotted nonchalantly back up the hill towards me. Needless to say from that point onwards he stayed on lead. In my defence (if there is any), this was day six. Day one and two he had stayed on lead and ignored the fluffy white things with spindly legs completely, even when they were right next to the path. Day three through to six, he had been off lead when there were no sheep in sight, on lead when I caught a glimpse of their fluffy little backsides. The flaw in this plan is that in bad weather – which appears with virtually no warning – visibility in the Highlands drops to nought. On day six, I made the mistake of thinking I could see further than two feet in front of me. Shame on me. Lessons for you to learn from my mis-endeavour. One, there are a lot of sheep in the Highlands and some of them choose to hide cunningly near the road in bad weather. Two, weather in the Highlands changes quickly, so ‘be prepared’ like a Scout. Three, dogs who appear to have no interest in sheep might decide they are much more interesting later. 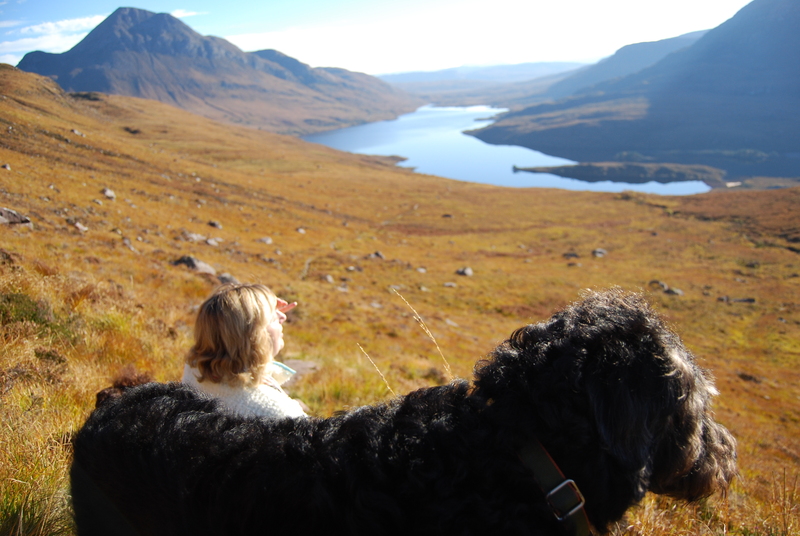 This incident aside (and ignoring The Curious Incident of The Dog barking at the kitchen roll in the Night-Time), the Scottish Highlands have won me over as dream doggy holiday destination. 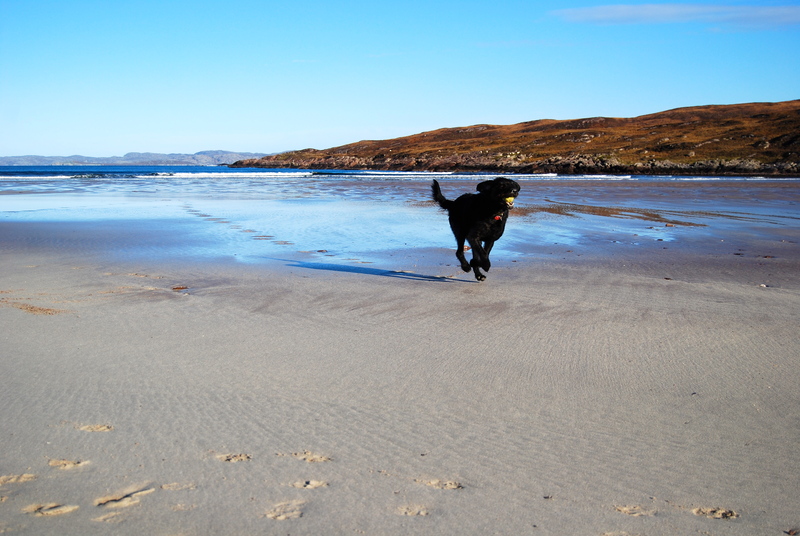 We stayed in Achiltibuie, a small village on the northwestern coast of Scotland, which has lots of dog walking options straight from the door or within a short driving distance, albeit with lots of sheep. One of our favourites was the climb up Stac Polly, a circular mountain walk which takes in far-reaching views from all sides. It’s not for those scared of heights though, as some parts of the path drop away rather spectacularly on one side. This also makes it not an advisable walk in high winds. Probably not advisable for dogs with no self preservation, too. Reaching the peak itself is described as a ‘scramble’ and best left to those with a bit more experience and balance but the main circular path, although a workout for those not used to walking up hills (ie me), is accessible for regular walkers. You might have to take a few breaks though! Most information says it will take you between two and four hours, so don’t be trying it at dusk. 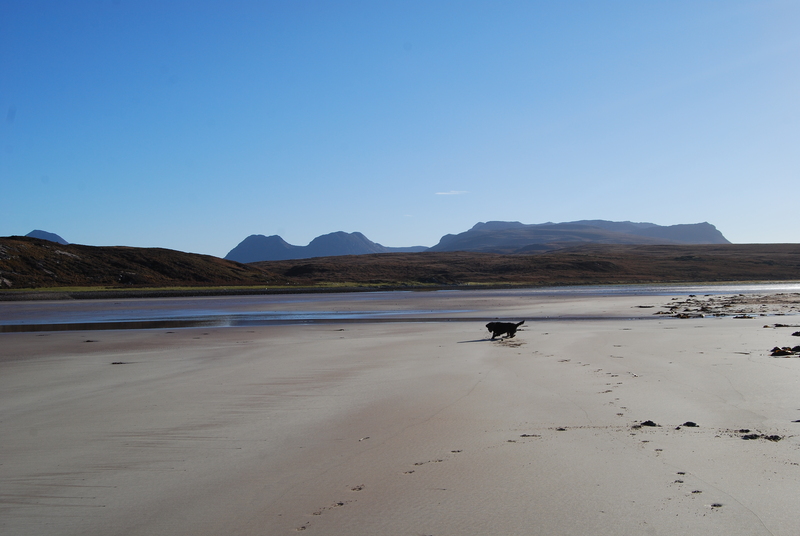 Another favourite was Achnahaird Beach, considered to be one of the best in Scotland and only about a five-minute drive from Achiltibuie. This sweeping expanse of sand was always quiet when we visited at the end of October. Although it’s only a short walk down to the sand from the car park, armed with a ball thrower it was perfect for successfully tiring Rory out for the rest of the day. The scale of it is impossible to show in a picture, so here is a selection. The river on the far side of the beach. Rory loves beaches. They are his favourite thing. 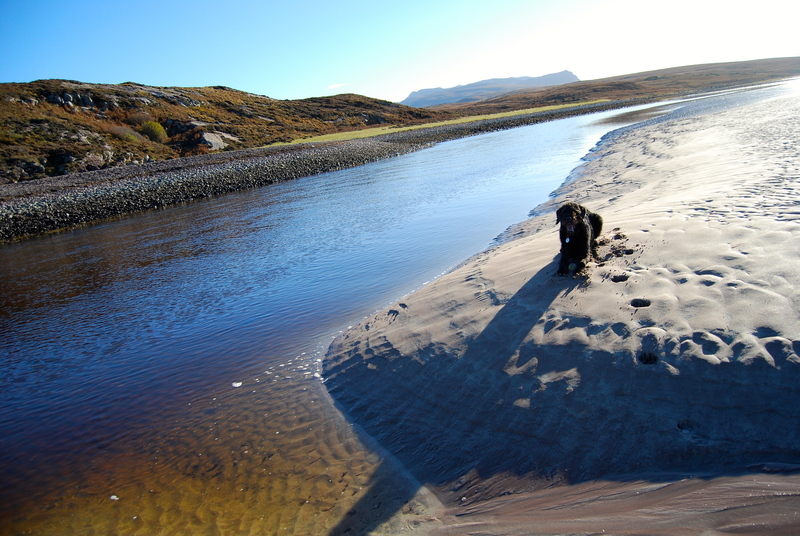 And there was another beach within walking distance from our self-catering cottage – Achininver. Again a sandy beach, it is accessed by a twisty path down the rocks. It’s not anywhere near as big as Achnahaird, but leads on to a rather lovely coastal walk. If you are in the Highlands, then take the 15-mile single track road to Achiltibuie. The view from the road is lovely – don’t look if you’re driving, drops ahoy! – and the view from the village to the Summer Isles is so stunning that even Rory couldn’t stop taking it in (or maybe he was looking for that sheep). 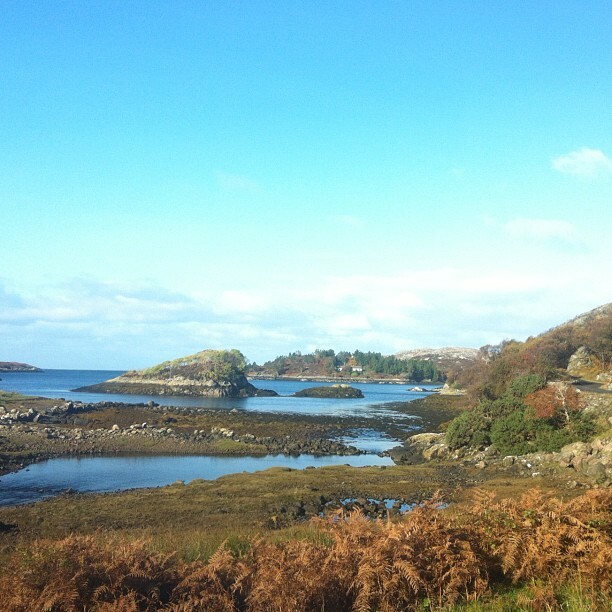 Incidentally, the prize for the best views from a road goes to the back road to Lochinver, but that is quite a scary drive if you’re not used to high narrow roads! The Summer Isles Hotel is open April until October and boasts Michelin-starred chef Chris Firth-Bernard if you do decide to visit. Our favourite eatery was the Am Fuaran Bar, a pub based in Altandu, just 5 miles from Achiltibuie. Run by a brother and sister team, this atmospheric pub is full of dark wood and historic knick knacks, and the food is fab but not cheap. On our first visit, we were bought wine by a friendly local. On the second, we had to wait 15 minutes for the haddock to come from the fisherman – now that’s fresh! – but we didn’t mind. When you’re on holiday, what’s the rush? They also run a campsite just across the road, if that’s your thing. They are open all year round, but the pub is closed during the day outside the tourist season – call ahead to check. Although both these eateries do have a limited amount of outside seating, neither allow dogs inside. 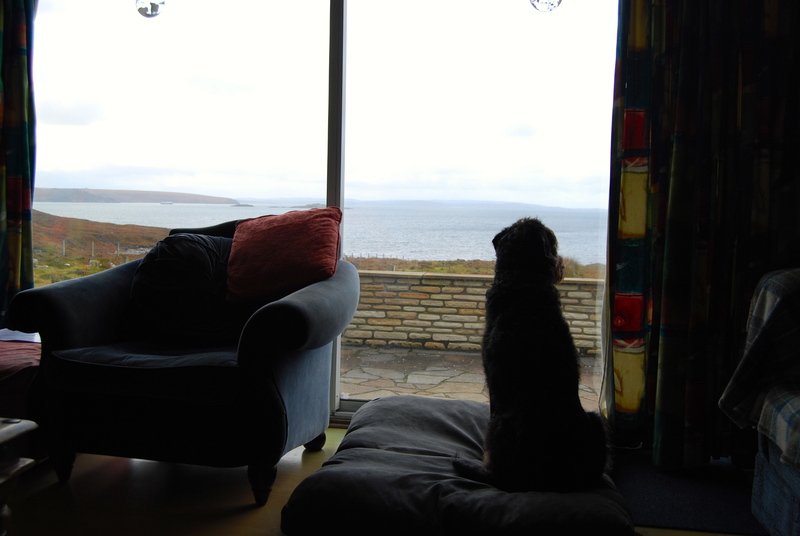 This was fine for us as it was cold, so Rory stayed in the car, but it is something to bear in mind if it is hot, as our holiday cottage had the standard ‘Do not leave the dog unaccompanied in the house’ clause. I loved the Highlands and so did Rory, so we’ll be going back. Maybe I’ll see you there? 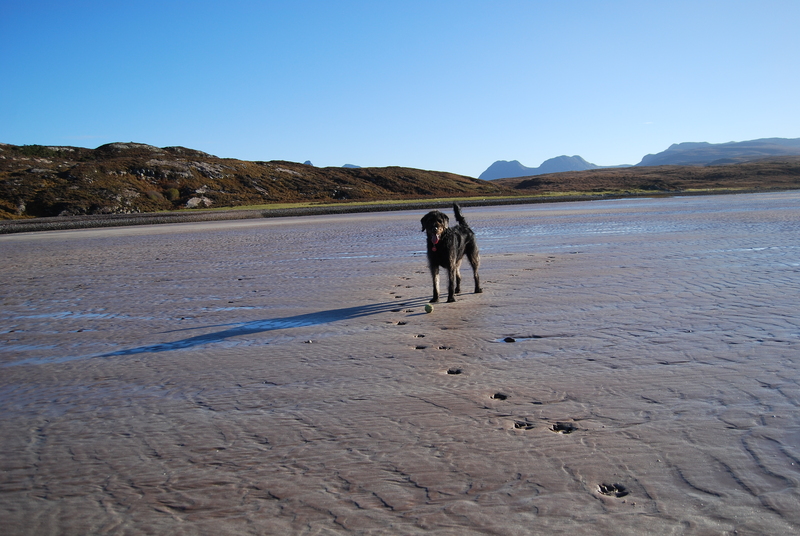 Doggy holiday review: Achiltibuie in the Scottish Highlands | Live. Love. Learn. Write.